President Barack Obama formally endorsed Hillary Clinton today, calling for party unity to win in November and "build a brighter future for this country we love." 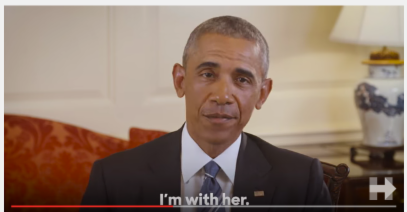 In a video message released by the Clinton campaign this afternoon Obama stated, "I don't think there's ever been someone so qualified to hold this office ... I'm with her. I am fired up, and I cannot wait to get out there and campaign for Hillary." President Obama will begin campaigning with Clinton next week in Wisconsin. The former Secretary of State, US Senator and First Lady made history Monday when she reached the requisite 2,383 number of delegates needed to clinch the nomination and become the first woman to lead a major US party as its candidate. Obama also credited Bernie Sanders with motivating "the millions of Americans, not just Democrats, who cast their ballot for the very first time." Senator Sanders, who met with the President this morning prior to the release, committed to working with Clinton to fight Republican nominee Donald Trump, while also vowing to stay in the race through next Tuesday's final Democratic primary contest in Washington, DC. Sanders is holding a rally at RFK Stadium tonight at 7pm. To watch the live-stream, go to: Sanders Speaks at RFK on YouTube. Check out the DemList Convention Calendar for all events and news!